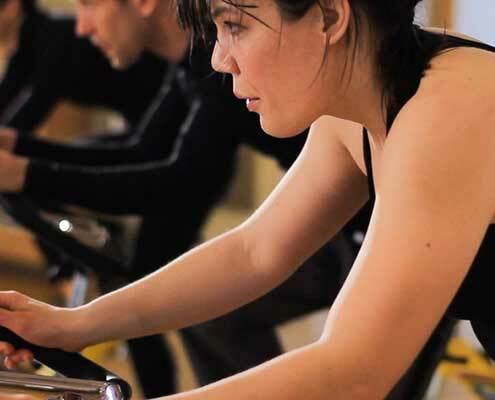 Indoor Cycling is a fun cardiovascular workout performed on special stationary bikes. An instructor at the front of class leads participants through routines designed to simulate outdoor rides. Together, the class travels down flat roads and up steep hills with sprints in between. You control the bike’s resistance and the frequency of your pedaling. You will be motivated by great coaching and upbeat music, and may find yourself pushed to pedal harder and faster by people around you. All fitness levels are welcome. If you are a beginner, plan on arriving to class 10-15 minutes early so we can help set up your bike. Bring a water bottle and wear comfortable, sweat-friendly workout clothes. For comfort in pedaling, wear your hardest-soled athletic shoes. If you have cycling shoes, note that our pedals have SPD clips. Must be 14 years or older to participate. Why not mix it up? We offer several cycle-inspired formats so you can work out how you want, when you want. If you wanna hop on the bike and go, this awesome cardiovascular workout is for you. Indoor Cycling meets Barre training as you blend 30 minutes of cardio with 30 minutes of strength training. Add some strength to your cycling. Five-minute intervals push your body to the limit in this intense combo class.